A Christmas Carol – A Christmas Carol in Prose, Being a Ghost-Story of Christmas, commonly known as A Christmas Carol, is a novella by Charles Dickens, first published in London by Chapman & Hall in 1843; the first edition was illustrated by John Leech. A Christmas Carol tells the story of Ebenezer Scrooge, an old miser who is visited by the ghost of his former business partner Jacob Marley and the Ghosts of Christmas Past, Present and Yet to Come. After their visits Scrooge is transformed into a kinder, gentler man. Dickens wrote A Christmas Carol at a time when the British were examining and exploring Christmas traditions from the past, such as carols, as well as new customs such as Christmas trees. He was influenced by experiences from his own past, and from the Christmas stories of other authors, including Washington Irving and Douglas Jerrold. Dickens had written three Christmas stories prior to the novella, and was inspired to write the story following a visit to the Field Lane Ragged school, one of several establishments for London’s half-starved, illiterate street children. The treatment of the poor and the ability of a self-interested man redeeming himself by transforming into a more sympathetic character are the key themes of the story. There is discussion among academics as to whether this was a fully secular story, or if it is a Christian allegory. Published on 19 December, the first edition sold out by Christmas Eve; by the end of 1844 thirteen editions had been released. Most critics reviewed the novella positively. The story was illicitly copied in January 1844; Dickens took action against the publishers, who went bankrupt, further reducing Dickens’s small profits from the publication. He went on to write four other Christmas stories in subsequent years. In 1849 he began public readings of the story which proved so successful he undertook 127 further performances until 1870, the year of his death. A Christmas Carol has never been out of print and has been translated into several languages; the story has been adapted many times for film, stage, opera and other media. There followed upon this four others: “The Chimes,” “The Cricket on the Hearth,” “The Battle of Life,” and “The Haunted Man,” with illustrations on their first appearance by Doyle, Maclise, and others. The five are known to-day as the “Christmas Books.” Of them all the “Carol” is the best known and loved, and “The Cricket on the Hearth,” although third in the series, is perhaps next in point of popularity, and is especially familiar to Americans through Joseph Jefferson’s characterisation of Caleb Plummer. Dickens seems to have put his whole self into these glowing little stories. Whoever sees but a clever ghost story in the[iv] “Christmas Carol” misses its chief charm and lesson, for there is a different meaning in the movements of Scrooge and his attendant spirits. A new life is brought to Scrooge when he, “running to his window, opened it and put out his head. No fog, no mist; clear, bright, jovial, stirring cold; cold, piping for the blood to dance to; Golden sun-light; Heavenly sky; sweet fresh air; merry bells. Oh, glorious! Glorious!” All this brightness has its attendant shadow, and deep from the childish heart comes that true note of pathos, the ever memorable toast of Tiny Tim, “God bless Us, Every One!” “The Cricket on the Hearth” strikes a different note. Charmingly, poetically, the sweet chirping of the little cricket is associated with human feelings and actions, and at the crisis of the story decides the fate and fortune of the carrier and his wife. Dickens’s greatest gift was characterization, and no English writer, save Shakespeare, has drawn so many and so varied characters. It would be as absurd to interpret all of these as caricatures as to deny Dickens his great and varied powers of creation. Dickens exaggerated many of his comic and satirical characters, as was his right, for caricature and satire are very closely related, while exaggeration is the very essence of comedy. But there remains a host of characters marked by humour and pathos. Yet the pictorial presentation of Dickens’s characters has ever tended toward the grotesque. The interpretations in this volume aim to eliminate the grosser phases of the caricature in favour of the more human. If the interpretations seem novel, if Scrooge be not as he has been pictured, it is because a more human Scrooge was desired—a Scrooge not wholly bad, a Scrooge of a better heart, a Scrooge to whom the resurrection described in this story was possible. It has been the illustrator’s whole aim to make these people live in some form more fully consistent with their types. 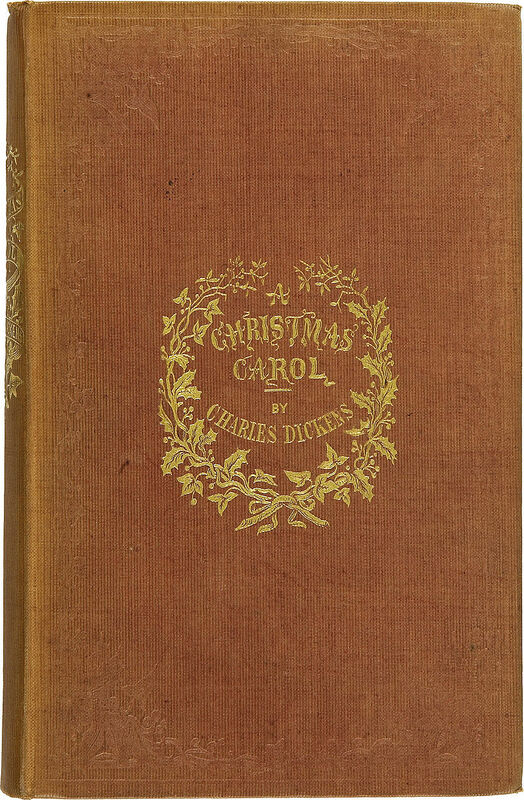 In the history of English literature, Charles Dickens’s A Christmas Carol, which has been continuously in print since it was first published in the winter of 1843, stands out as the quintessential Christmas story. What makes this charming edition of Dickens’s immortal tale so special is the collection of 80 vivid illustrations by Everett Shinn (1876-1953). Shinn, a well-known artist in his time, was a popular illustrator of newspapers and magazines whose work displayed a remarkable affinity for the stories of Charles Dickens, evoking the bustling street life of the mid-1800s. Printed on heavy, cream-colored paper stock, the edges of the pages have been left rough, simulating the way in which the story might have appeared in Dickens’s own time. Though countless editions of this classic have been published over the years, this one stands out as particularly beautiful, nostalgic, and evocative of the spirit of Christmas. Charles Dickens is probably the greatest novelist England ever produced. His innate comic genius and shrewd depictions of Victorian life (along with his memorable characters) have made him beloved by readers the world over. In Dickens’ books live some of the most repugnant villains in literature, as well as some of the most likeable (and unlikely) heroes.